Tomorrow marks the end of Hanukkah, the traditional Jewish celebration of one-night's worth of oil burning for eight. Today's Nice Price or Crack Pipe Autocars Sabra roadster comes from the traditionally Jewish State of Israel, but will its price light your fire? Created in 1948 through the dividing of Palestine, Medinat Yisrael, or the modern State of Israel has ever since been a U.S. ally and trading partner. One business for which trading has been almost exclusively unilateral between the two has been the automotive industry, Israel having lacked a significant presence in the category over the years. In the mid 1950s, at attempt was made to change that, and with the help of Reliant Motors of Tamworth, UK the candidly named Autocars was born. Initially building versions of the popular, but dreidel-like, Reliant three-wheeler, the company's later 4-wheel Sussita became Israel's best selling car. Autocars had hopes of cracking the U.S. market with the Sussita, but sales proved elusive. A decision was made to attempt to build a name by offering a niche sports car, a form which seemed popular in the States at the time, and hence the Sabra made its debut at the 1961 New York Motor Show. Aside from assembly and name, there's not much Israeli about the Haifa-built Sabra, in fact most of the car is sourced from Autocars' good friends back in Britain. The chassis was derived from a company called L.M.B. Components in Surrey, while the fiberglass body panels were laid up by Ashley Laminates in Essex. Engines came from Ford UK, as did the four-speed transmissions. The suspension and brakes were Reliant parts. In fact, some of the cars were actually built by Reliant in Great Britain, although they differed from the Israeli cars. Regardless, the final point of assembly for the vast majority was Israel, and that makes it the first - and so far only - Israel sports car you can buy. From 1962 though the end of production in '68, Autocars offered the Sabra almost exclusively in the U.S., and out of the almost 380 cars built, over half were sold here. An additional 45 cars were constructed for Reliant to sell in the UK, and, surprisingly, a significant number were sold in Belgium, home of the giant waffle. 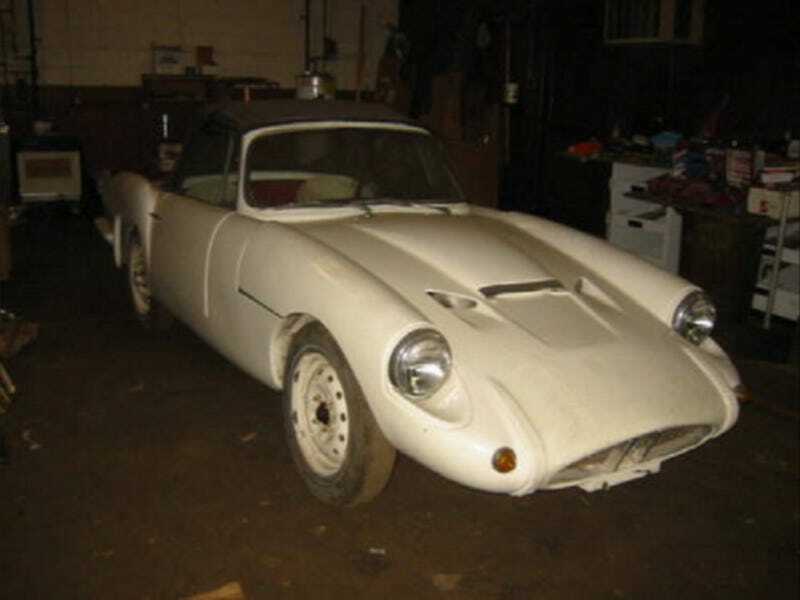 This particular 1961 Sabra roadster has been on the market now for some time, and has seen its asking price deflate by a couple of grand as no takers has stepped forward. As a matter of fact, the car was featured on ebay last week, at its current eleven-five price, again with nary a nibble. The car itself is a bit of a project, although it looks like it needs more of a cleaning and maintenance update rather than a full-on restoration to bring it back into decent shape. The seller does say that while the engine starts, the car is not currently drivable, likely indicating a failure in the hydraulics rendering both brake and clutch non-working. The 1,703-cc Ford Consul engine and its sister manual gearbox provided the Sabra with enough power to get out of its own way, but barely enough to compete with the sixes from Triumph and Austin Healey, and hence a larger Zepher 2,553-cc six-powered edition was tried. This car sports the four. Claimed originally red, its now white and etiolated body evidences not 40 years wandering the desert, but a nearly similar time squirreled away in some dark venue. The fiberglass appears intact however, and it's a fun opportunity to play what's that car? with the many homage'd brands evidenced in its many curves and lines. There's Mercedes 190sl in the rear three-quarters, Daimler Dart in the nose, and Triumph Spitfire in the sides, tying the whole thing together. See, fun! The interior, seems to have most of the unobtainium bits intact, and in fact looks pretty good for what's claimed to be original, despite the nearly 50 years and 19,000 miles it has seen. The top even seems to be serviceable. The seller claims that this car appeared at the 1961 New York World's Fair, which is strange because there was no 1961 New York World's Fair. There was a Motor Show in the city that year, and as noted previously, that was where the Sabra made its U.S. Debut. If this car is one of the NYMS cars, then there's some provence to leverage, if of course, it can be proved. The Sabra officially ended production in 1968, but Reliant went on to produce the Scimitar sports car on the platform, and that car continued for decades, albeit without any connection to Haifa, or the home-brew Hebrews who built its predecessor. For those who have a penchant for all things Hebrew, as well as the most obscure of all sports cars, the Sabra is a no brainer. There is that issue with the price and the fact that the seller doesn't seem to have found the chosen few who might want to buy it. What do you think, is that $11,500 price a deal even considering its condition, and the fact that the Sabra wasn't that great to begin with? Or, would you demand this seller set his Sabra free!? Cars and Classics or go here if the ad disappears.